Billy Cunningham had a guest on his syndicated radio show on Sunday March 11 who had predicted Trump's victory. Many Americans must have seen the "handwriting on the wall" and initiated a change away from our Nation's our downward spiral. 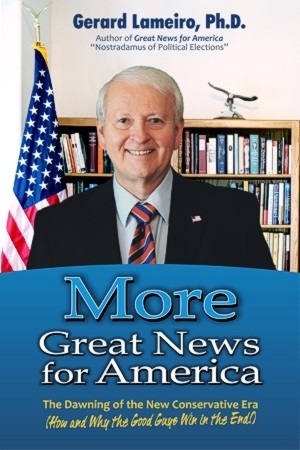 Gerard Lameiro's new book, More Great News for America predicts a return to faith in God, renaissance of reason and a rebirth of morality, freedom, peace and prosperity. His website is www.greatnewsforamerica.com. I thought we had lost it for the past decade because of the difficulty in undoing bad policy in our Country. Then, unexpectedly, a man arises unlike any other to save our Nation from the doom and gloom. Not only is it entertaining but substance declares real hope. Now look at the direction in which we are headed. Not just another psychic but a "Nostradamus of Political Elections" and "America's #1 Political Analyst" by "radio and TV hosts across the country". If you look at his record you'll be excited about what he's saying about the future. A one-of-a-kind time to be alive!